Oh, hi there! Nice to have you here! 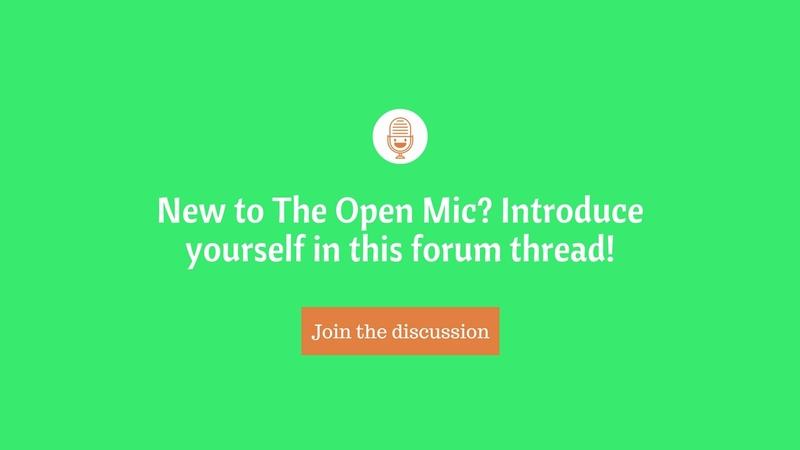 This is The Open Mic's Forum. Kinda like a digital equivalent of a watercooler in the office. This is where the awesome people of The Open Mic community hang out, exchange stories, share ideas and have fun discussions on a variety of topics. If you're new here, make sure you watch this video cause it explains how this forum works and how you can get the most out of it. Once you've registered with Twitter or Facebook simply jump into this discussion and tell everyone a few things about yourself. 3) Your favorite Bruce Willis movie? & would like to join your discussions about translation"
Hi! I'm Dmitry. I'm an English-Russian translator and video game localization specialist. I help video game developers translate their video games into Russian, increase sales and reach new markets. Favorite Bruce Willis movie? Die Hard, duh! Hello everyone! I'm Beverly Hayes, an English to Spanish Translator specializing in website localization and marketing/advertising translations. I have been trying to establish my brand for the past 8 months, and I also teach online for BYU-Idaho. Is Bruce Willis in the movie the 6th sense? I think the movie is so creepy, but it's also so amazing! Welcome to this forum, Beverly! It's really nice to have you here! Thank you so much for helping me out with some beta-testing. You're the first here! Is this the one about a boy who saw dead people or something? I think he's in it. Dmitry yeah, that's the one! I am Effie. I am an English into Greek technical-medical translator, translating mostly user guides. I love dog training (I have 3 dogs and a cat) and I am also a Judoga. Effie Welcome to our forum, Effie! It's so nice to have you here! What kind of user guides do you normally translate? Medical equipment? This is Anusha , a Japanese to English translator(mostly IT related) from Tokyo. I've been working in a bilingual environment for almost 10 years now! Hi @anu_tomodachi! Lovely to have you here! Can I ask what kind of IT texts do you normally work with? My language pairs are English/French>Spanish (which is my mother tongue). LeilaEsgaib Welcome to this forum, @LeilaEsgaib! Lovely to have you here! Hey there everyone! I'm Valérie, English to French translator, mostly in tourism & travel, but also in environment related topics, education & healthcare, and international development, and I love it! Hello everyone, I'm James LaRue. I translate from German, Italian, French and Spanish to English for TransPerfect Legal Solutions and I have direct clients. I'm interested in discussion topics such as how to find new clients, running a translation business and learning foreign languages. And thank you, Dmitry, for starting The Open Mic. LaRueTranslations Welcome to this forum, James! I'm glad to have you here. It's not super active, yet, but feel free to start new discussions and suggest topics. Cheers! Anne-Sophie here, or Anne, or Ana, whichever best suits your language! For two years now I've been an EN/ES > FR (France, Belgium, Switzerland) translator, FR editor and also linguistic/cultural/business consultant for SMEs in small but adorable Belgium. Owlet is the name of my company. My specialties? Arts, culture, humanities, international (relations and business), communication and marketing. I also started a blog last year because I love sharing readings, organisation tips and discoveries with fellow linguists. Feel free to have a look. Favorite Bruce Willis movie ? Death Becomes Her, with the amazing Meryl Streep, of course! I hope we will have a chance to talk soon! P.S. : Death Becomes Her is one of the funniest movies of all times!